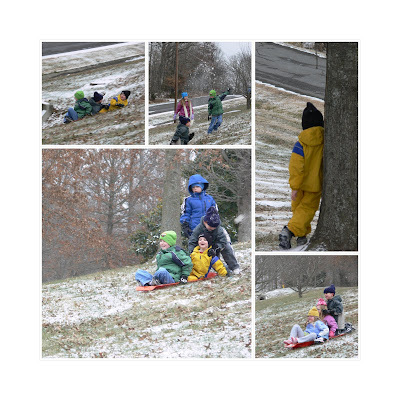 Spunky Little Monkeys: Snow Days...Yes, even in TN! Snow Days...Yes, even in TN! Ok I KNOW I have a a lot to get caught up on here with this blog. But it's a new year and new goals. I hope to get back into this full swing like before *wink* So mother nature and the over paranoid people of the south, decided that 16 days off from school wasn't enough. First week back the kids scored a 4 day weekend! Today we decided to take the kids sledding. They had a BLAST! 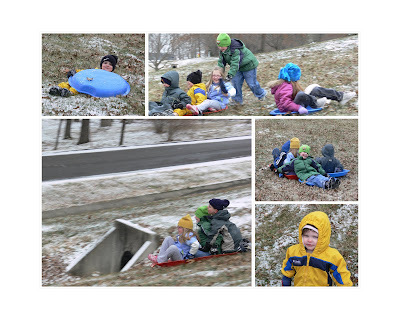 Though it doesn't look like there's much snow on the ground it was frozen enough that they still flew down the hillside in the sleds. Our best friends the Taylor's were with us and brought the super fun sleds the kids had such a GOOD time with! For some reason all the kids thought it would be fun aim for the concrete drain at the end of the hill! There were a couple close calls but no body got hurt. PHEW! I had another picture collage to go on here but for SOME reason it won't load *sad face* I'll see what I can do in the next few days. I'm excited to get Christmas on here! We had a great Christmas and a slammin' good New Year's party! Hope everyone we know and love are well and healthy. And from us to you, a VERY belated Merry Christmas and Happy New Year!